With the long Easter weekend just days away, I thought I would share a special recipe this week ready for you to enjoy with friends and family over the holiday. These eggs are really quite amazing and I hope you'll agree that they are far more delicious than any shop bought egg I have ever tried. These make such a lovely gift for anyone trying to steer clear of processed treats, or make a batch and store them in the freezer so they are always at hand. 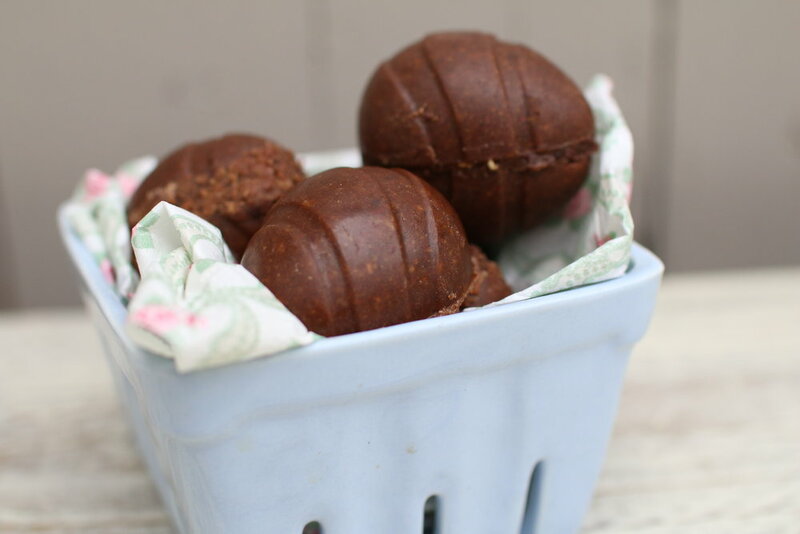 They are pretty easy to make too - the only challenge is to not eat them all in one go! Of course, if you don't have egg moulds you can always make them into other shapes, like the cute bunnies in the pictures - they taste just as good. Heat the coconut oil and cacao butter together until they become liquid. Stir in all other ingredients except for the cacao powder and cacao nibs. If you add them too soon, the oil may be too hot and burn the chocolate! Once the other ingredients are combined and smooth add the cacao powder and then the cacao nibs. Spoon the chocolate into the moulds (might have to do this in stages depending on how many moulds you have handy!) leaving a little to one side to use as glue if you want to stick the egg halves together. Set each batch in the freezer for 20-30 minutes until solid. Then, if you are making whole eggs, use the remaining chocolate mixture to glue the halves together.